· Job creation in the new EU Member States (NMS) and the EU candidate countries remains low despite high GDP growth in most countries. However, there are significant differences in developments among these countries (most recently between Poland and the other new Member States). · Labour markets in the NMS/candidate countries differ significantly from those of the EU 15 countries in terms of employment rates, employment patterns and unemployment. There are persistently high shares of long-term unemployed, youth unemployment is twice as high as in the EU-15 and there are diverging trends in female and youth employment rates as compared to the EU-15. · The service sector (in particular market services) has become the main source of employment, but in some countries manufacturing employment growth has resumed as well. Job creation (in employment generating services and manufacturing industries) has matched job destruction (in other activities) at least in some of the NMS. · Services are dominated by low-skill sectors, while most high-skill sectors are still underdeveloped; the latter show, however, the most dynamic employment growth both in relative and absolute terms. · Future employment opportunities will arise primarily in market services - particularly in high-skill sectors, while jobs in transport and telecommunications will decline further. There is also scope for new job creation in communal services, especially in health and social services. · Stimulating the creation of part-time jobs - the share of which in total employment in the NMS is negligible compared with the EU-15 - would be conducive to increasing employment, particularly of women. · The educational composition of the NMS labour force is biased in favour of those with medium-level education (i.e. those who have completed upper secondary schooling or training); relative to the EU-15, the NMS have smaller shares of both people with tertiary education (the 'highly educated') and those at most with only basic schooling (the 'low-educated'). Within the group of 'medium-educated' there is a larger proportion who have completed vocational training programmes rather than general upper secondary education compared to the EU-15. · The employment rates of the highly educated in the NMS and the EU-15 are similar, rates for the medium-educated are also much the same in the more advanced NMS (the Czech Republic, Hungary, Slovenia and Slovakia) as in the EU-15 but somewhat lower in the other countries; but employment rates are very low (and, conversely, unemployment is high) for the low-educated (the two exceptions are Slovenia and Romania). 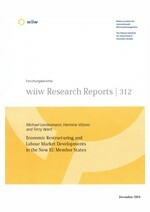 · There are a number of structural features accounting for these employment rate differences: the primary sector (largely agriculture) accounts for a high proportion of the employment of the low-educated and this sector has lost jobs on a massive scale in most NMS; furthermore there is an 'under-representation' of the low-educated in both industry and market services in the NMS compared to the EU-15. The medium-educated, on the other hand, are particularly strongly represented in the workforce in industry which in turn specializes (as compared with the EU-15) in medium-skill sectors. This provides job opportunities for the medium-educated; however, strong productivity catching-up in industry tends to reduce jobs. Finally, the highly educated are particularly in demand in the high-skill sectors of market services (financial and business services), which have expanded strongly both in the NMS and the EU-15, and in publicly provided services; in fact, the highly educated in the NMS are disproportionately employed in public services (compared to the EU-15) while there is relatively low employment of the highly educated in industry. · Overall, the very low employment rate of the low-educated in the NMS seems to be a function of three factors: a high proportion employed in agriculture which is shrinking; a relatively weak representation in the labour-intensive, lower-skill sectors of industry and market services; and, linked to these two factors, a tendency to be out-competed for jobs by the medium-educated in a situation where the latter are in relatively abundant supply and there is much slack in the labour market. · An analysis of occupational structure in the NMS supports this picture: there is, in comparison to the EU-15, a smaller share of low-skill manual jobs in agriculture, industry and market services, i.e. the type of jobs which could provide job opportunities for the low-educated. Also in public services, there is a relative under-representation of low-skilled non-manual jobs compared to the situation in the EU-15. This is consistent with the low-educated being substituted by the medium-educated. · Finally, an analysis of changes in the structure of the labour force over the more recent period (1998-2003) and of the younger age cohorts shows significant adjustments in the educational characteristics of the labour force towards an 'upgrading' in educational attainment; however, the speed of change on the demand side is such that the labour market position of the low-educated has deteriorated further. Furthermore, an age cohort analysis indicates that in a number of respects educational attainment levels are adjusting less in the NMS than in the EU-15.